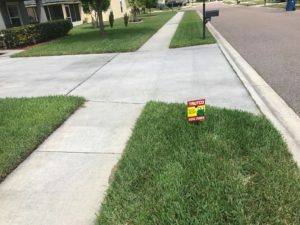 we are continuing to treat large patch fungus and weeds in your lawn. November’s pre-emergent weed barrier is beginning to wear off this month and we have had several frosts this year. Most lawns have gone dormant as a result. This month we are treating winter annual weeds in your lawn. Our lawn applications will continue to be aggressive as there is less risk of turf damage associated with treating weeds this time of year. We will continue to treat active large patch and active insects during each monthly lawn care service. Fungicides must be reapplied every 28 days. Insects are active year round but the threat of damage is greatly reduced in the winter. Dormant, slow growing turf is not a very good food source. Reducing irrigation is the best prevention for large patch. You can expect your lawn to lose color this time of year. This is a natural part of your lawn’s life cycle. Continue watering once each week, and water each zone for 45 minutes. Watering for longer durations (45 minutes – 1 hour, rather than 20-30 minutes per zone) will encourage deeper root growth. Mowing at 4 inches will also encourage a deeper root system. We are always here to help you troubleshoot any issues that may arise. Good cultural practices are going to prevent common problems from occurring in your lawn.